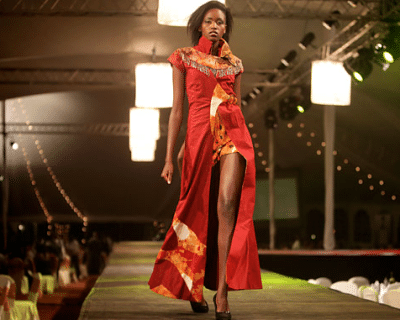 While Uganda continues to struggle with systemic challenges facing the fashion industry, it still remains one of the most active and thriving sectors in the country. The number one challenge still facing the industry continues to be the based around the myth that imported clothing, commonly known as “mivumba” in Uganda, means better quality. Figures from the US International Trade Commission show that Uganda imports a staggering amount of second-hand clothing annually from the United States, the UK, Canada and China. According to the Uganda Manufacturers Association, the East African Community’s annual expenditure on used clothes imports is $350 million, and is growing at a rate of 60 per cent annually. Added to this is the perpetually struggling cotton and textile sectors. The textile industry in Uganda has lost a lot of ground to competition from the Far East and to second-hand imports, only 5 per cent of the total cotton production is consumed by two local textile factories. But despite all of this, according to fashion designer Sarah Nakisanze, “[The industry] is thriving and growing because of the support of the middle class customer. I have no empirical statistical data on this, however, deductively, this is because the middle class enjoys public exposure and self-consciousness. “Technology has brought the world closer making the general public more creative and appreciative of style using minimum income and both designers and fashionistas are taking advantage of the situation. Also the growing youth population has helped a lot. Trendy designs, competitive prices and the use of quality fabrics will improve locally produced pieces from being low grade to premium level grade thus limiting the need for mivumba”. “I am happy that Ugandans are aware of what is trending in the international textile and fashion industry. But we need to do more, like Rwanda, to promote the ‘Made in Uganda’ campaign and give room to Ugandan fashion brains to cook up all sorts of designs and styles without relying on what the international industry provides. This, in the end, will help develop the fashion and textile industry in Uganda,” said Ugandan fashion model Fenando Kamugisha. What’s in store for SA’s clothing stores? See what streetwear brand Rosey & Vittori has to say about the South African fashion industry.